Oliver Goldsmith Yuhu (1966) - Black Need Help? 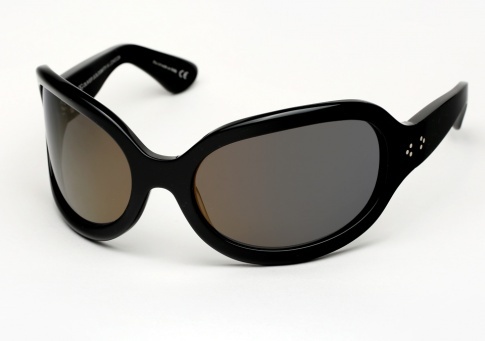 The Oliver Goldsmith Yuhu was originally made for Audrey Hepburn in 1966 for the movie Two for the Road. Hepburn famously wore it in white but also more subtly in black, during the film. Featured on the movie poster and heavily in fashion press throughout the mid 60’s rocketed this frame into iconic status. Now after several decades and many requests Oliver Goldsmith has re-released the YUHU. A true to form down to every last rivet, this is a showstopper if ever there was one. Worth noting, each frame comes complete with a luxe leather snap case specially made for the release. This is a limited edition sunglass, with only 200 pairs of each color being made. It is offered here in Black paired with grey lenses with a very subtle gold flash. Limited Edition: Only 200 pairs of each color being made worldwide. Hand drilled real riveted 7-barrel hinges for strength and durability.